Supplied as 80cm tall root tip to trimmed shoots, with a 60cm clear stem. Feed well when growing. Will grow to 1m tall in first year, and flower June - Sept in first and following years. 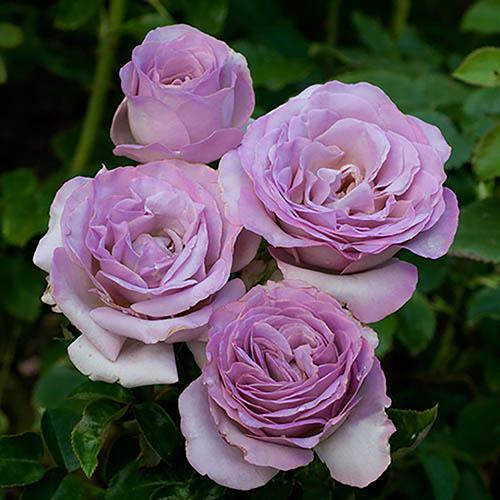 This distinctive rose variety has the most entrancing flower colour imaginable and one that is rarely seen in the whole rose genus. What is more, in this particular instance the beautiful blooms are held gracefully aloft on a strong 'Standard' stem with a ball of lush foliage that will become covered in blooms that stand proud above the rest of your patio displays. Flowering throughout the summer months it will be a major talking point within your patio garden and makes a perfect centre piece of any patio container, bed or border. Blue Beauty is incredibly easy to care for - it is repeat flowering, totally winter hardy and perennial so it will create it's breathtaking display year after year. Supplied as a dormant but freshly lifted bare root Half Standard that is 80cm tall. Keep the plant cool and the roots thoroughly moist until planting and once planted, water every few days for the first month whatever the weather. To ensure your rose gets off to the best possible start, whether planted in a pot or directly in to the soil, we strongly recommend providing support with a stout cane until the roots are fully established. When your rose is flowering, normally from May until October each year, occasionally remove any spent blooms and feed fortnightly with good quality soluble plant food with a high potash content. This will make the display look even more attractive and also encourage the maximum display for the longest period. .
Prune just once each year in February, merely tidying us the head into a symmetrical ball shape. supplied as a dormant bare root half standarsd rose c. 80cm tall, with a 60cm clear stem.